Evolution is a profound idea. It’s a simple theory that explains all of life’s diversity. But just because it’s simple doesn’t make it easy to understand. Many aspects of the theory run counter to our intuition. They also fly in the face of thousands of years of philosophical and religious thought. As such, it’s easy to understand why some people might get evolution wrong. But hopefully, the scientists know what they’re talking about. Right guys? Well, it turns out they aren’t immune to these mistakes either. Several studies show researchers making some fairly basic mistakes in their understanding of evolution. For centuries people have viewed everything as part of a ladder or “chain of being“. At the bottom are inanimate objects. It then progresses through various ranks of living things, before reaching humans at the top of the pile. Above us are angels (which some further try to subdivide) and the whole ladder then culminates in God. Although this concept had been around since the ancient Greeks, it got a new lease of life from evolution. Some thought it provided scientific justification for the existence of this chain of being. Humans were obviously at the top as the most evolved, with various lesser species (and sometimes races) beneath us. 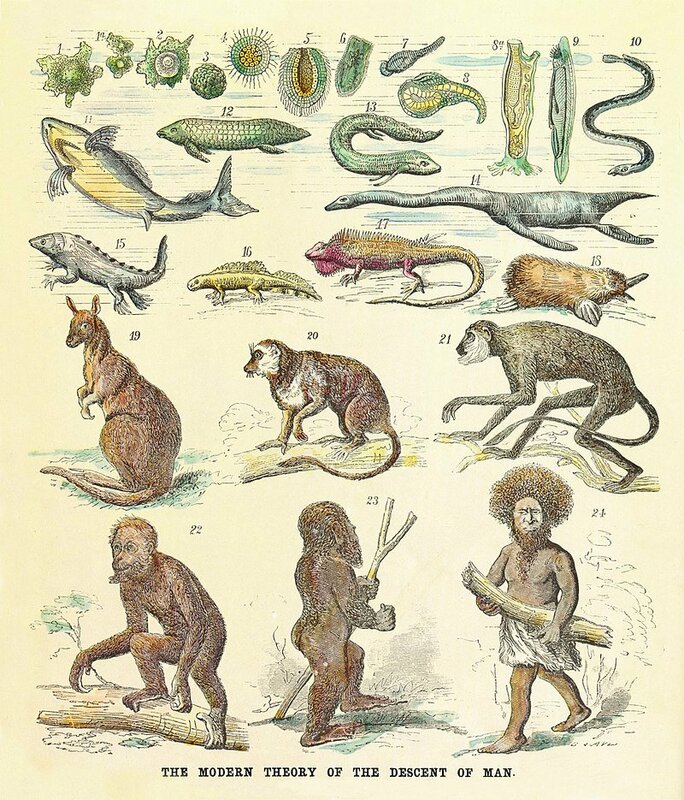 Even Darwin used this ladder language, describing some species as “higher” than others (although he did argue there wasn’t a real distinction between them and “lower” groups). Darwin’s objections were right of course. All species share a common ancestor, so have all been evolving for the same amount of time. Saying one is “more evolved” or “higher” than another is just getting evolution wrong. At best you could say one species is better adapted to a certain task or environment. But then, deciding which things to base these comparisons is questionable. We often prioritise what we’re good at, since we’re egocentric and like to have ourselves at the top of the pile. As such, scientists rightly shy away from these concepts. Instead, traits are framed in terms of archaic, derived, apomorphy and other fancy science words. Or at least, they should do if they know what they’re talking about. Despite Darwin’s objections “chain of being” thinking is still with us. 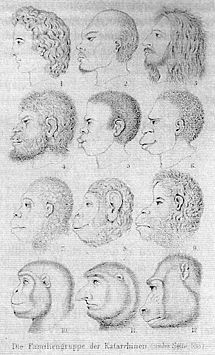 You’ve probably seen hundreds of pictures depicting evolution as some sort of progression, And ever wonder if humans evolved from monkeys, why are there still monkeys? Or encounter some bozo who thought that out loud? This sort of “evolution is progression” thinking is still around us. But surely scientists know better. They study evolution and understand its implications. Surely they recognise species did not progress along a chain of being. Unfortunately, having a degree doesn’t always guarantee you understand the subject. So some other scientists wanted to investigate whether this sort of misunderstanding was common in the scientific community. They gathered more than 67,000 scientific articles from top journals to see how commonly researchers wrongly described stuff as “higher” or “lower”. All in all, they found more than 1,500 articles using “chain of being”-style language. Whilst that might sound like a lot it actually adds up to less than 2%. So whilst the vast majority of scientists clearly understand evolution a substantial amount (in absolute terms) do make mistakes. Interestingly, botanists are the ones getting evolution wrong. It was plants that were most commonly described as “higher” or “lower” than others. Maybe this means that this is a cultural rather than personal problem. If plant scientists keep talking in this language, it may lead to their colleagues slipping up. So for the most part, scientists do understand evolution. There may be a few botanists sowing confusion amongst their ranks, but even they’re in the minority. Can we pat ourselves on the back and say job well done? Some think that might be a bit premature. You see, that initial study focused on explicit references to “chain of being” language. Were species’ labelled higher or lower? But there might be other ways this language could manifest. For instance, you could label animal noises as simple “communication” or make comparisons to advanced “language”. This sort of bias implies a chain of progression up to human speech. So, other researchers delved deeper and did find this narrative at work. Primates were often talked about in terms of “language” whilst other species got lumped with simple “communication”. Further, species differences influenced how these noises were described. 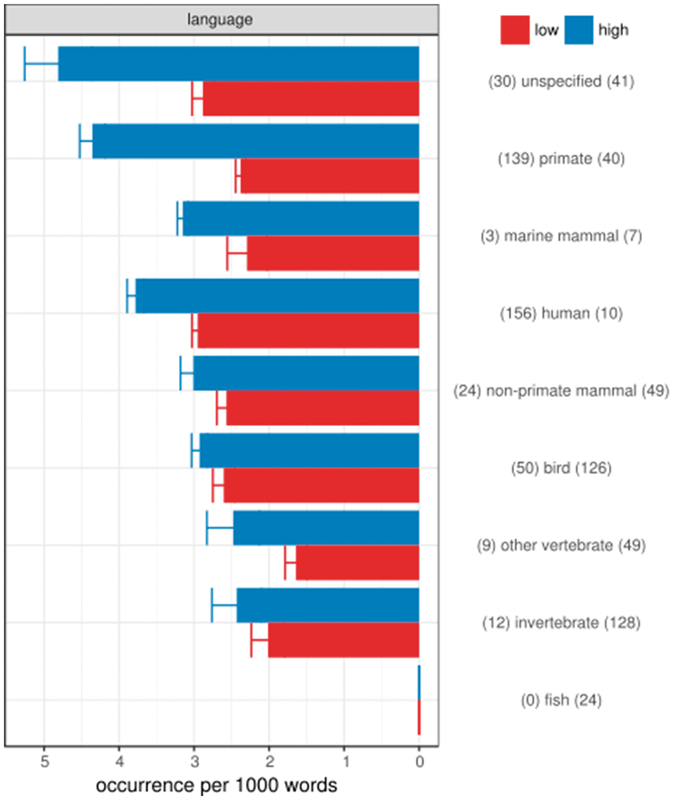 A primate call was twice as likely to be described with “advanced” sounding terms (like elaborate) than “primitive” terms (like basic). But bird calls got both almost 50/50. This isn’t quite getting evolution wrong. The rather random way groups are labelled suggest there isn’t a narrative of progression here. Other primates got positive terms more often than humans, after all. But what this does reveal is a bias. Our language is being used as the yardstick to judge animal calls. Or primate calls to be more exact. Of course, it’s biased we’ve picked our language as the criteria for judgement. But that doesn’t mean the resulting labels are unfounded. But still, it’s easy to see how these descriptions could lead to misunderstandings. Scientists need to be careful. And if they have these problems, think of the public! Evolution outreach is more important than ever. Crucially, outreach framed right. Anyone can help with this by just avoiding progressionist language. We need to make apomorphy a household word. On the plus side, we can all feel a little less guilty when some nuance of the theory slips us up. The experts make mistakes too. That said, the “why are there still monkeys” people still have no excuse. Not even botanists get it that wrong. Rigato, E. and Minelli, A., 2013. The great chain of being is still here. Evolution: Education and Outreach, 6(1), p.18. Ullrich, R., Mittelbach, M. and Liebal, K., 2017. Scala naturae: the impact of historical values on current ‘evolution of language’discourse. Journal of Language Evolution, p.lzx017. Previous post: How quickly did Neanderthals grow up? As a botanist then why do you think this is? Are people just repeating the terminology of textbooks? First, I apologize for the delay. Well, I think that -in Botany- it is a consequence of a summ or combination of factors: history, “reverence to authority” and human’s tendency to interpret evolution in wrong ways. History: some influential scientist (ex: Edwin Bessey) explicitly labelled “primitive” vs. “derived” features in plants. These proposals largely remained untested and were simply accepted as true. Bessey labelled his proposals as “dicta”, but his followers (among them the very influential Arthur Cronquist) used them more as a dogma than ideas to be tested through the scientific method. Until today “reverence to authority” plagues Botany. Many botanists just simply follow a given “Pope” without hesitation and questioning; many times as a way to show how “up-to-date” they are. This means that they won’t question the terminoly these reasearchers use -for instance- in textbooks. 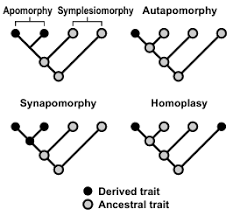 Yet, part of the problem -in my opinion- is that humans tend to visualize early diverging groups (incorrectly called “basal”) as a summatory of everything that may be plesiomorphic. If I am correct in this interpretation, we cheat ourselves because the older a linneage is, the more time this linneage had to acquire apomorphic features. Yet we tend to visualize early-diverging-groups as frozen in time. Well, I hope this was of some use for you. All the best! That was very helpful, and certainly, reminds me of the state of palaeoanthropology up until perhaps the 70s/80s. The authority figures had a lot of sway, dictating terminology, research perspectives and so forth. One of the things I think shook the field out of it was that these figures often came to blows with each other and new evidence, ultimately revealing how shallow their basis for authority really was. For instance, Francois Bordes was a primary figure and strong advocate of the idea different Neanderthal toolkits represented different co-existing tribes in France. But as better dating became available and it turned out these populations weren’t contemporary, much of his clout fell away. I could see botany continuing along those lines if such conflicts are perhaps rarer. Are they? Do you see these “popes” of yours going along with each other? Well, yes…and no. In the late 90’s (1998) the first botanical classification grounded in phylogenetics (known as APG, acronym of “Angiosperm Phylogeny Group”) was proposed. It originally involved thirty something botanist from different areas and the classification was meant to “evolve” by incorporating new available evidence. The two first versions were coordinated by Birgitta Bremer and things were pretty well until then (2003). The two late installments/versions had another coordinator and a much smaller and less diverse team (some participants with questionable grounds for such a task, I dare to say). 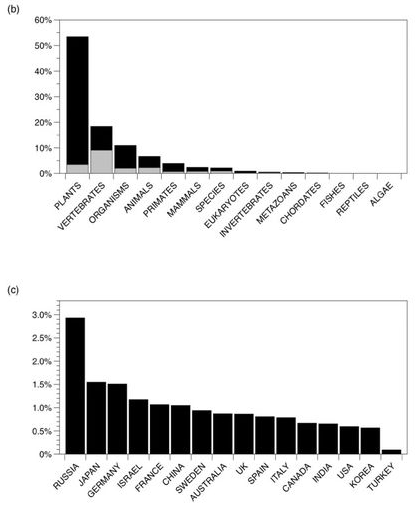 Needless to say, the current APG classification became more autoritative and the late version (2016) even proposes the provisional use of some names that the author know that repressent non-monophyletic taxa. That was inconceivable in the two first versions, as far as I know. As a teacher I became really enthousiastic with the very first versions and I even proposed a discipline dealing with the APG classification for graduate students. Today I feel highly dissapointed with the two late versions and I seriously consider adopting the PhyloCode proposal instead. Briefing, botanical classification experienced a great period until 2003. After that, it was “the Revenge of the Popes”, or “The Popes strike back”, if you prefer. As someone who studies liverworts, (probably) the sister group to all other land plants (mosses, hornworts, lycophytes, ferns, and seed plants), the situation in botany can be particularly frustrating. Last week the first liverwort genome was published, which is great; but it came with much fanfare about the insights this “first land plant” genome would bring to our understanding of plant evolution. Of course Marchantia polymorpha is no more the first land plant than a random angiosperm is. And though is is small and thalloid, it’s far more complex in structure than the earliest land plants are thought to have been so the taxon is not even a good choice as a stand in. But Marchantia has a long history as a model organism and is used in Botany courses in just this way. Plant evolution is still taught in the ladder of evolution format, and from the angiosperm pov it sort of makes sense, with important characters for surviving on land seemingly appearing at each divergence. Angiosperm species vastly outnumber all other plant groups combined and are super important to humans, so it makes a compelling narrative, and the other groups appear as relics on the way to the success of the flowering plants. I’m not sure it’s as big a problem within flowering plants, but the stage is certainly set in how plants are viewed. Teaching plant evolution this way involves a lot of oversimplifying to the point of lying such as “bryophytes are still dependent on water and are confined to moist environments” when in fact they grow everywhere including deserts. Mosses and liverworts are morphologically diverse, number in species second only to angiosperms and have all kinds of cool adaptions, but they are understudied because of this bias. Another reason why this is the case so much more with Botany could be that land plants are a monophyletic group that is much younger than animals, and flowering plants are younger still. In some ways they are more similar and more closely related than animals are.